This rare book contains a fascinating guide to the learning of English from the perspective of those native to other countries, concentrating on the constructions peculiar to each language and explaining them in a way that makes them easily comprehensible for those concerned. 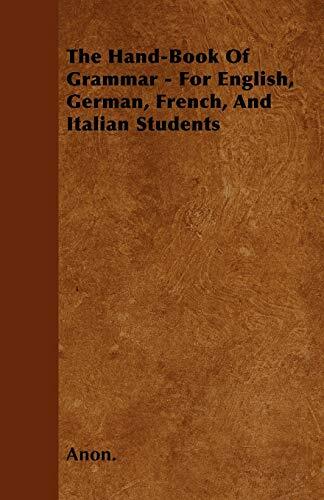 This comparative grammar text has been carefully compiled from a great number of the best English, German, French, and Italian Grammar texts, and is intended as a book of reference for those who have already some precursory knowledge of these languages. A highly accessible and comprehensive text, The Hand-Book of Grammar constitutes the perfect text for European learners of the English language and makes a great addition to any collection of linguistic texts. This rare book was originally published in 1841 and is proudly republished here with a new introduction to the topic and in the hope that this immensely valuable handbook can continue to be of use to discerning linguists now and in the future.